Join the community by signing up to receive these posts by email, and please feel free to send us your questions. On this blog, we try to answer some of the most pressing questions that face edtech entrepreneurs. What are the possibilities for AI in Education? It seems the tech space, including edtech, is bursting with companies using artificial intelligence. I’m intrigued by all the excitement, but I’m also cautious about how much substance is behind the hype. What are the possibilities for AI? How is AI being used for education? Artificial intelligence has many exciting applications in education: from sophisticated assessments to personalized tutoring systems. As we discussed in a previous BlendED post, over 40 AI acquisitions happened in 2016. These numbers are climbing: recent research predicts that the AI education market will increase 47.5% by 2021. 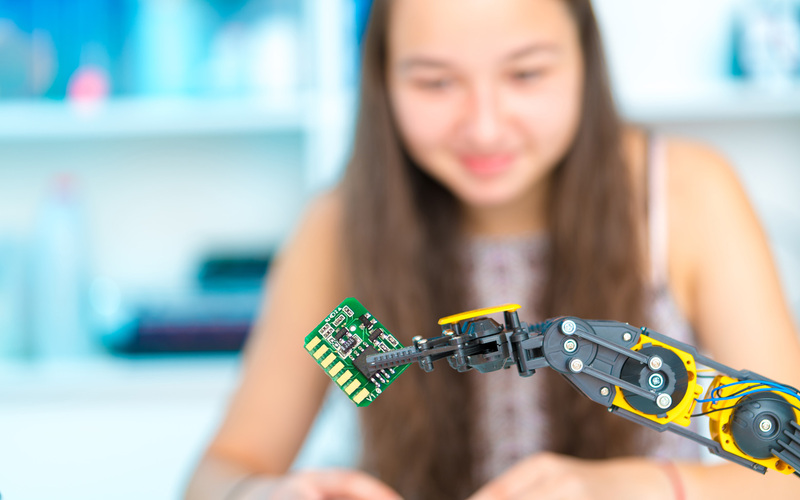 Despite its influence, AI in the field of education remains a sensitive topic – specifically, what does AI mean for the future of teaching jobs? AI should not be used to replace teachers, but instead, should be used to superpower them to support the needs of students. AI can be incredibly valuable for teachers given that day-to-day instruction often requires tasks that consist of pattern recognition and repetition. Because AI software is able to learn such patterns on its own, computers can store, remember, and infer information at a scale that human brains cannot. As a result, AI is being used to assist teachers in performing low level tasks (i.e. grading, giving feedback, and answering administrative questions), providing teachers with the opportunity to spend time on tasks that require more thinking, such as building relationships with students and spending the time necessary to provide them a personalized level of education. I don’t claim to be an expert in AI, but I’m lucky enough to know a few entrepreneurs that are living and breathing AI everyday – Arjun Singh from Gradescope, Matthew Ramirez from WriteLab, and Jamie Poskin from TeachFX. They’ve kindly provided insight for this piece. So, how is AI currently being used in education? Grading can be time-consuming, repetitive, and even boring for teachers. And as a consequence, they are subject to mistakes. Gradescope, one of the leaders in AI application, has recognized an opportunity for AI to provide a solution. Gradescope uses technology to “cluster” similar student responses together while professors grade exams. This allows the grader to comment on grade clusters and fan out feedback to relevant students. Because the software stores data continuously, Gradescope presents a comprehensive, clear picture of a student’s performance throughout the course. Gradescope ultimately eliminates the repetitive aspects of grading so that teachers can focus the bulk of their time on giving students what they need valuable feedback and great teaching time. Reviewing papers is one of the most time consuming and burdensome tasks for teachers, and some of this time is spent checking for style, grammar, and punctuation errors. While this feedback is important in improving student writing, it tends to be repetitive and standardized, hence an opportunity to get a machine to help! WriteLab, a platform that combines machine learning and natural language processing, identifies patterns in students’ writing, provides feedback, and suggests revisions. In doing so, WriteLab eliminates repetitive tasks (e.g. editing grammar quality, essay length, word sophistication) that teachers usually perform, and allows students to present better versions of essays for teachers to grade. This personalized and rapid automated feedback improves student writing. And as a result, teachers have the ability to focus on the deeper, complex feedback by reviewing papers that already incorporate the standardized feedback that a machine can identify and handle. In giving feedback, AI can also help teachers gain insight into behavior they wouldn’t have seen on their own. For example, AI is enabling teachers to evaluate their teaching through careful analysis of classroom dialogue. By recording classroom conversation via voice recognition technology, TeachFX makes it possible to consistently track and analyze lectures. As Jamie explains, “speech drives learning, so the more you get your students talking, the more they’re going to learn.” As a tool that uses machine learning to provide feedback to teachers, TeachFX combines voice recognition and data analysis to determine the types of student talk vs. teacher talk that occur in the classroom. From this feedback, teachers can then improve student engagement and make tangible changes to their teaching style and curriculum, while also becoming aware of their unconscious biases, blind spots, and strengths. In the case of TeachFX, machine learning has the ability to help improve the educational experience for both teachers and students. Above all, AI opens up a new possibility: regular feedback for teaching practice. As we’ve discussed, AI plays an important role in supporting teachers and eliminating lower level tasks. While AI has proven beneficial in the cases of TeachFX, WriteLab, and Gradescope, would it be useful for your edtech startup? In answering this question, the first, and perhaps most important, step is to figure out your business fundamentals before even considering AI implementation. Your goal doesn’t need to be to make the most innovative technology, but perhaps a platform that improves an aspect of education. AI should be the means but not the mission. For example, Arjun states, “For the first 1.5 years of our company, we didn’t even start thinking about automation in grading,” ironic given that Arjun and his co-founders are UC Berkeley researchers in the AI field. In determining whether to use AI, it is important to think about the most efficient way to achieve your mission. What are the needs of your users? If your goal can be best fulfilled with AI, then start thinking about automation and machine learning. But remember that AI isn’t always necessary to create an innovative edtech platform. Above all, technology has to serve a clear pain point and learning purpose. No one will buy your product only because is it AI-powered. However, if implemented correctly, AI does have the potential to advance the educational experience for both teachers and students. 1 Comment → What are the possibilities for AI in Education? All the examples given focus on Natural Language Processing usage of AI. Really exciting things are happening in the strand of AI that utilizes deep learning software architecture. One question we need to ask in the edtech community is how can we move towards utilizing technology to move beyond the traditional models of pedagogy delivery. Edtech takes on a new world when when students become creators and not observers. One of the company’s you mentioned did do that–WriteLab. This is a market problem, K-12 and higher ed administrators are seeing their students move into this type of learning roles, through applications like YouTube, Soundcloud, blogging platforms, etc… I would love to see more AI products that help students become creators and educators project managers for these students. Lots of exciting potential with AI in education.